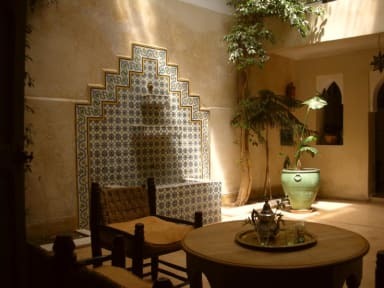 This house is a perfect example of traditional Moroccan Riad constructed with handcraft arts and smooth coloured Tadlakts (stucco), and provide a Moroccan salon with a fire place and beautiful fountain in the patio. 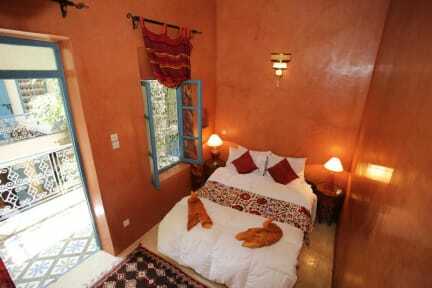 Derb Dabachi is typical Moroccan traditional area near by the famous square of Jamaa El fanna in Marrakesh. Dar Raha is just one minute from the souk and famous places in Marrakesh, beside is very quit for the people how are seeking for the tranquillity. All rooms have air-conditioning and private bathrooms surrounded by Moroccan decoration and rooftop terrace with green plants and nice view to enjoy the sunshine of Marrakech. Free Wi-Fi is accessible in the open patio area.Breakfast is included in the price and served in the patio when the weather is nice. For other meals, we are offering sample traditional Moroccan dishes.